Beautiful white, rose-shaped miniature flowers. This sub-tropical evergreen native to Japan, can bloom at any time. Blooms profusely with single or double white flowers. Small foliage. Very slow grower. 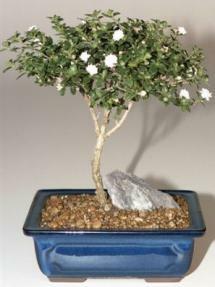 Not to be confused with Serissa Japonica blooms. Recommended indoor Bonsai tree. 8 years old, 6" - 8" tall.